We’ve been in our house for almost 3 years now, and our most-used guest room (the other serves mostly as my jewelry storage area for Stella & Dot) has been left unfinished this entire time. We have a great king-size bed in there, but the room is not much bigger than the bed…. so it doesn’t leave much space for a bed frame. 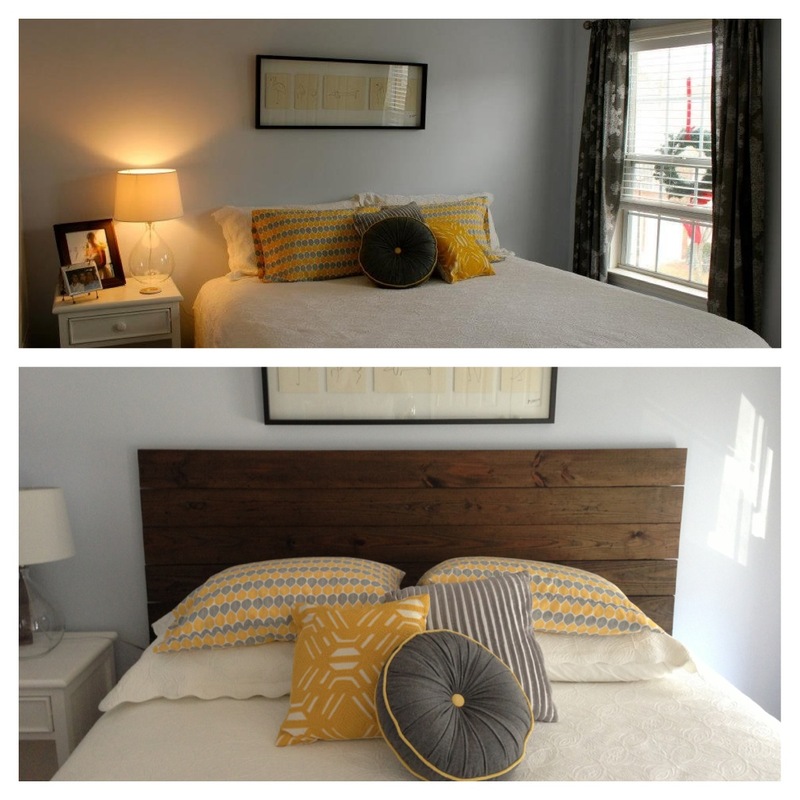 I’ve been eyeing the DIY wooden headboards for some time now, so we finally had a weekend with time to spare recently and jumped on the chance to make the guest room more complete. I’d found several inspiration photos on Pinterest, and thanks to my favorite bloggers Young House Love and their new DIY book, we had a great starting point. 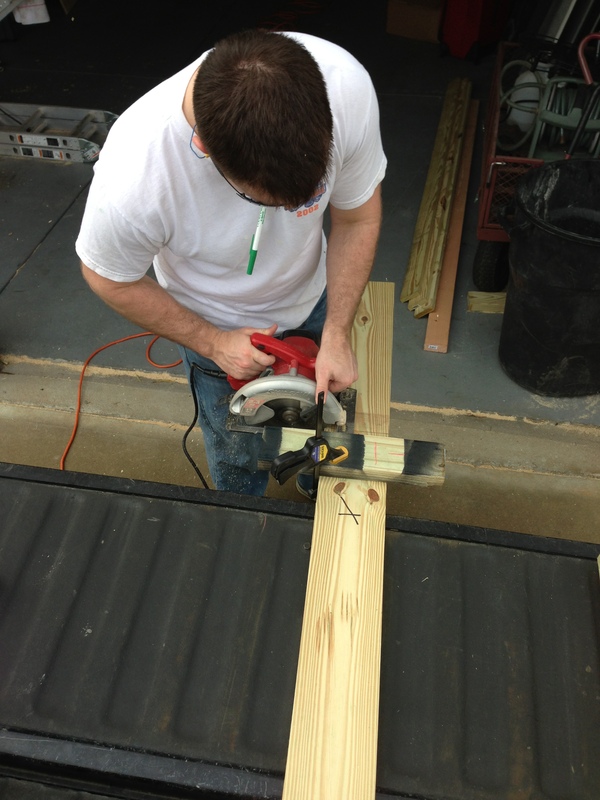 Also, Craig is quite handy and loves to build things, so I gave him my general idea and let him work his magic. Here’s an inspiration photo from YHL’s book. I love the weathered and worn look of the boards. 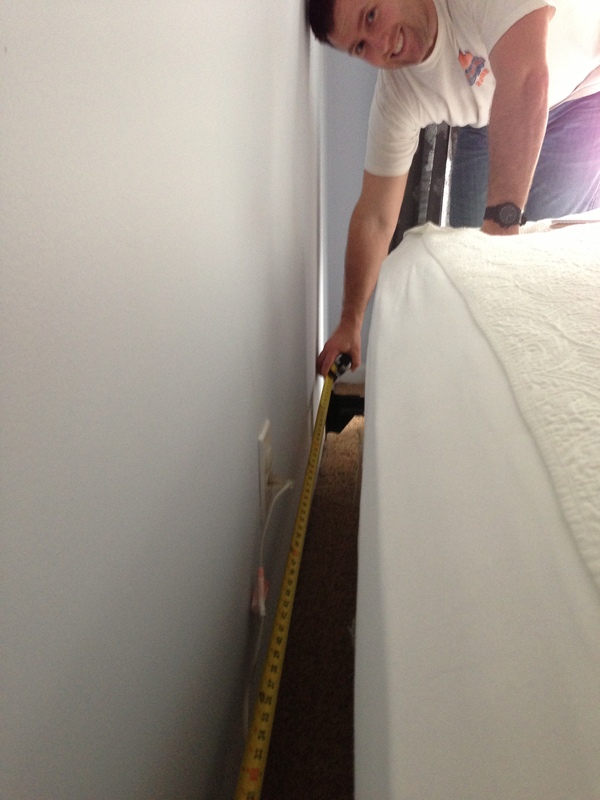 First, we measured the width of the bed to determine how wide we wanted the headboard to stick out. We decided to keep it at the same width of the bed, given that there’s not more than a couple feet of wall space on each side. We also measured for height — it was sort of a guess, so we just measured to about where we wanted the headboard to hit on the wall and figured out how many 1×6 boards would be needed). 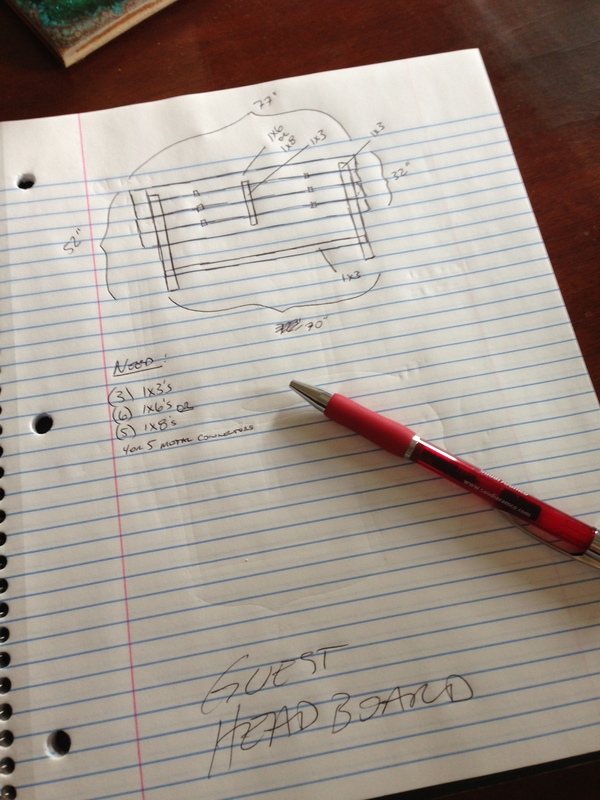 With measurements complete, Craig drew up a sketch to plan out how many boards and other materials would be needed. 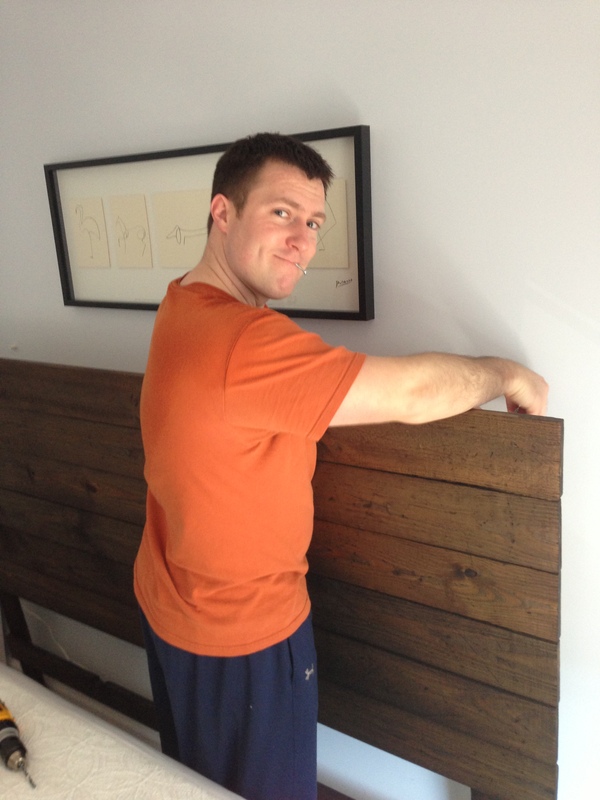 We planned to have wooden braces along the back for support, as well as legs to stand the headboard up (vs. hanging it on the wall because it would be so heavy). 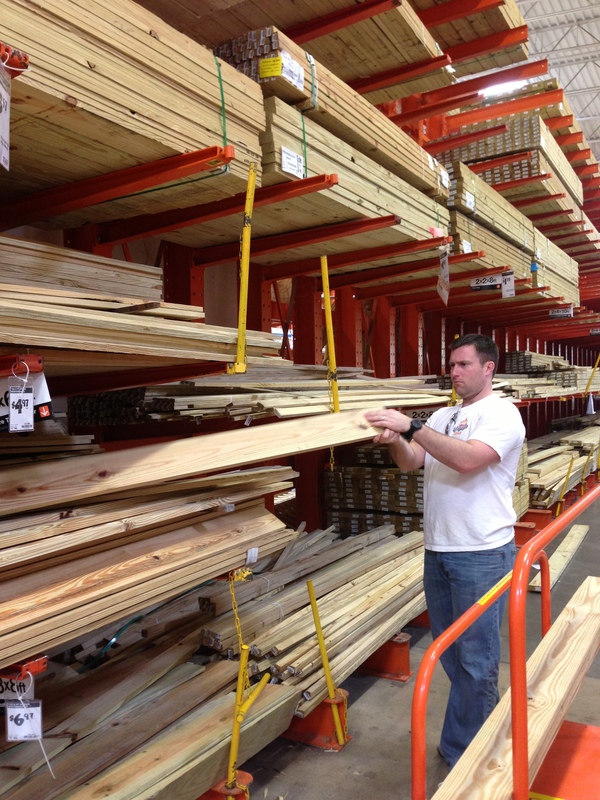 Next up, a trip to Home Depot! Craig examined every board to make sure they weren’t warped or cracked (see below). 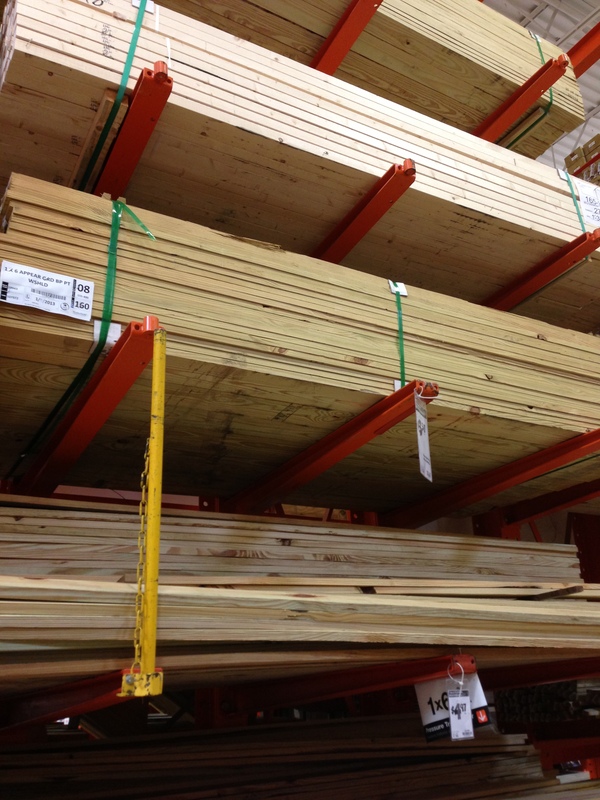 I supervised and approved boards for their general appearance. 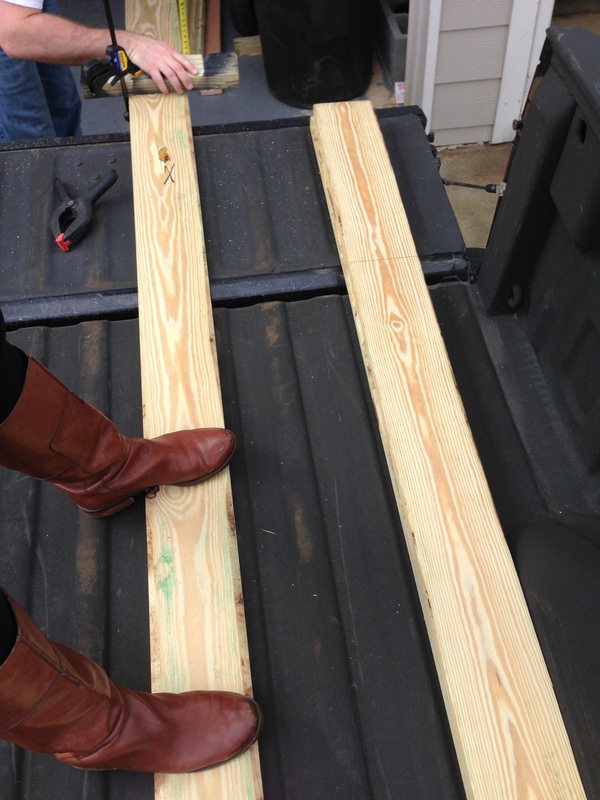 Craig’s tailgate makes a great table for cutting wood. 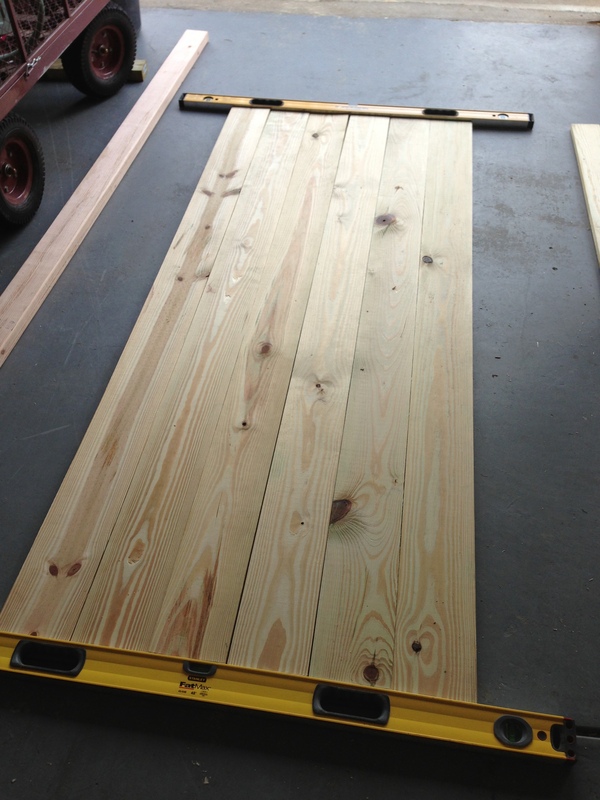 He trimmed each board to fit the determined width of the headboard, and I helped by standing on the them while he cut. Once cut, he lined them up between 2 levels to make sure everything was even before securing with the smaller wooden braces. He also added a brace connecting the 2 legs for more stability. 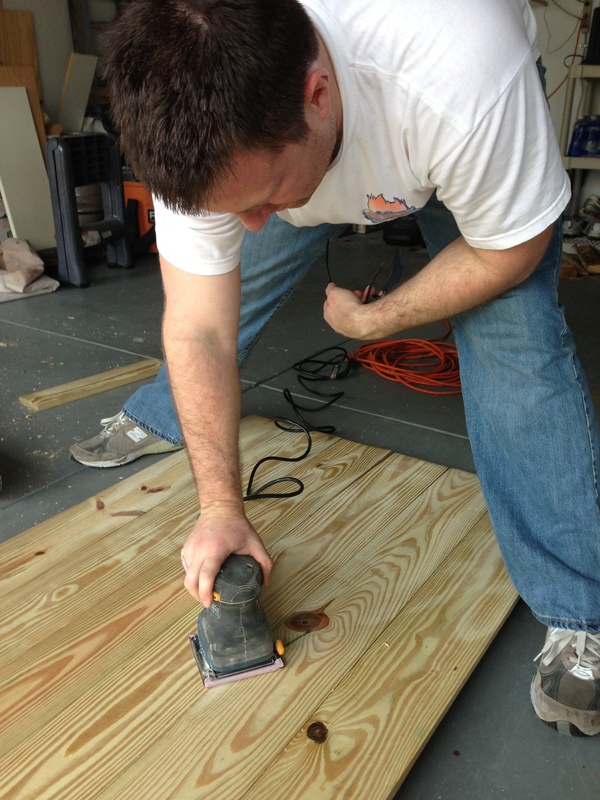 Once it was smooth, we distressed the boards with bags of screws, a hammer, and anything else sharp we could find to bang against them. I’m sure our neighbors appreciated that. 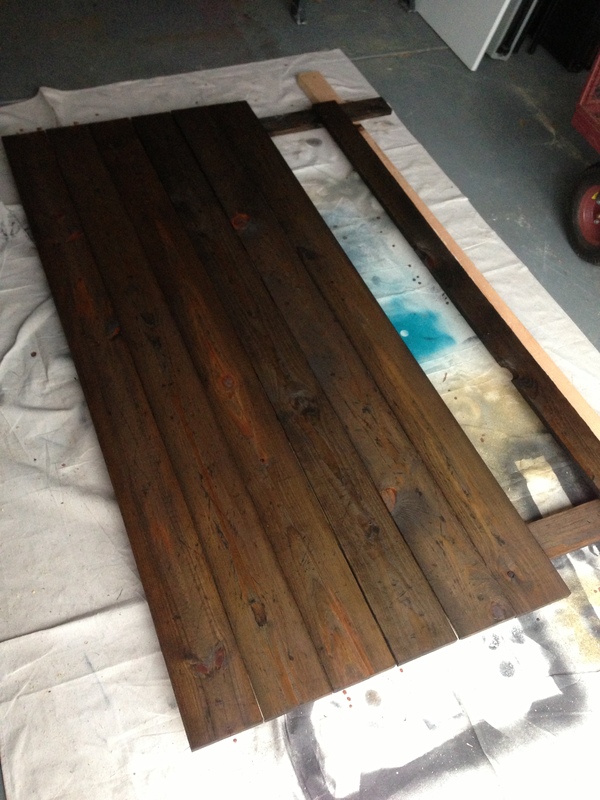 And then we stained! I wanted a deep, dark stain, and this is the same one YHL used in their book (referenced above). 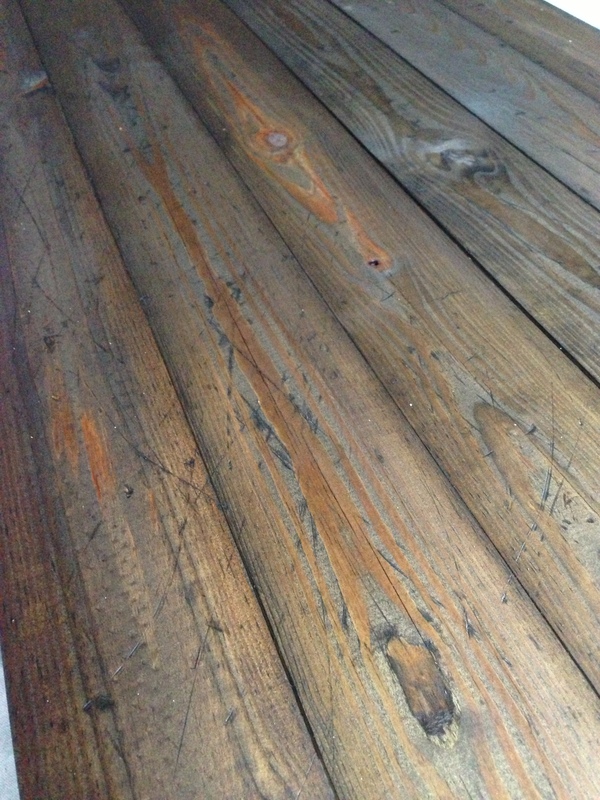 This is after one coat of stain was applied. We waited about 10 minutes and then wiped the boards down with a cloth to remove any excess stain. I was worried that the distressing we did wasn’t going to show up, but once the stain seeped into all the little grooves and dents, the “worn” look magically appeared! I LOVE IT!! We left the headboard in the garage to dry for a solid week because it was raining so much that we weren’t sure how well it would dry. Last weekend, we hauled it upstairs (that sucker is heavy!) and when we set it down, realized that the top and bottom were still not completely dry. Drat!! It was too much work to carry the headboard upstairs, so we just put it in place and pulled the mattress away from the wall until it’s completely dry. 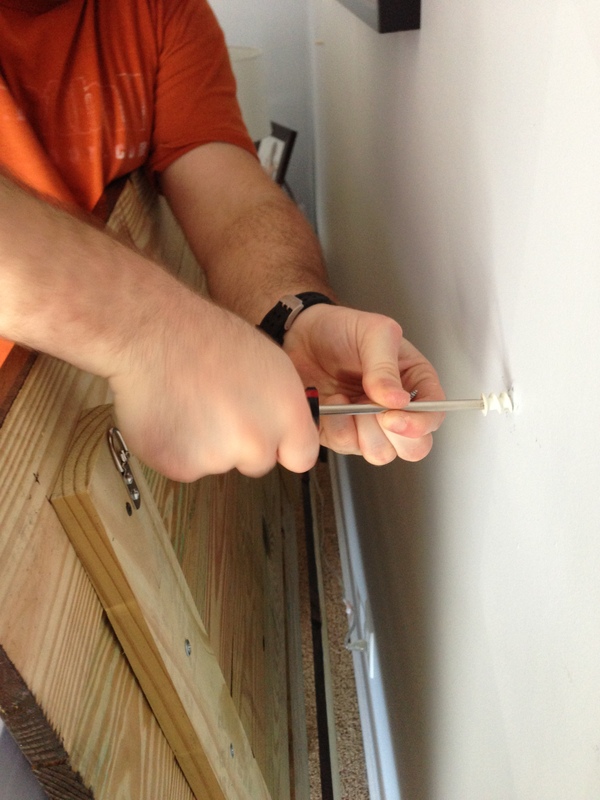 To make it extra secure, Craig attached metal rings on the backside (1 on each end) to loop over screws in the wall. I couldn’t be happier with how it turned out — and it cost right at $60! I don’t think we would have ever found a sturdy, well-made (and not 1970s-ish) king-size headboard for anywhere close to that. I love the warmth is brings to the room, and the white/yellow/grey color scheme of the bedding really pops against it. Melissa! 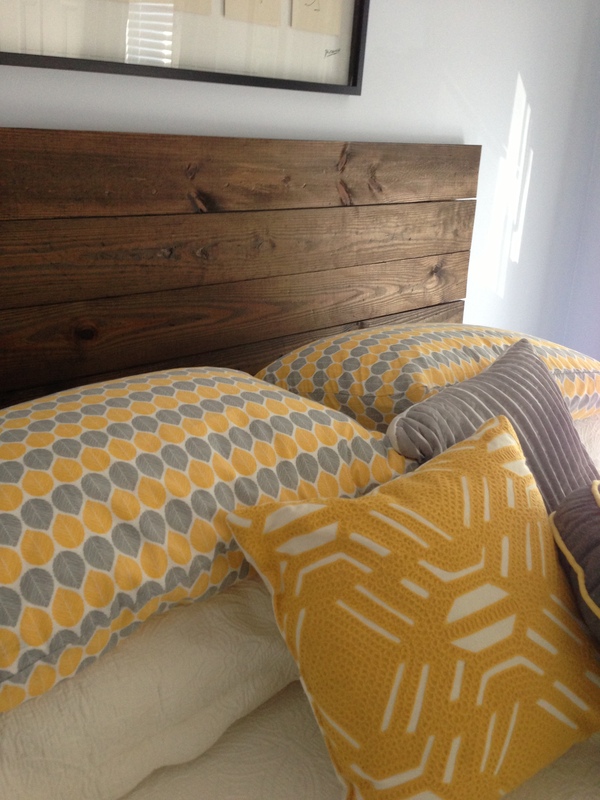 That looks great and now I want to build a headboard. lol I don’t even have a bed to do that for. Kudos on such a great project! Thanks, Nannie! Craig must have inherited Pawpaw’s woodworking skills! The headboard is awesome. Can’t wait to come up and try it out! 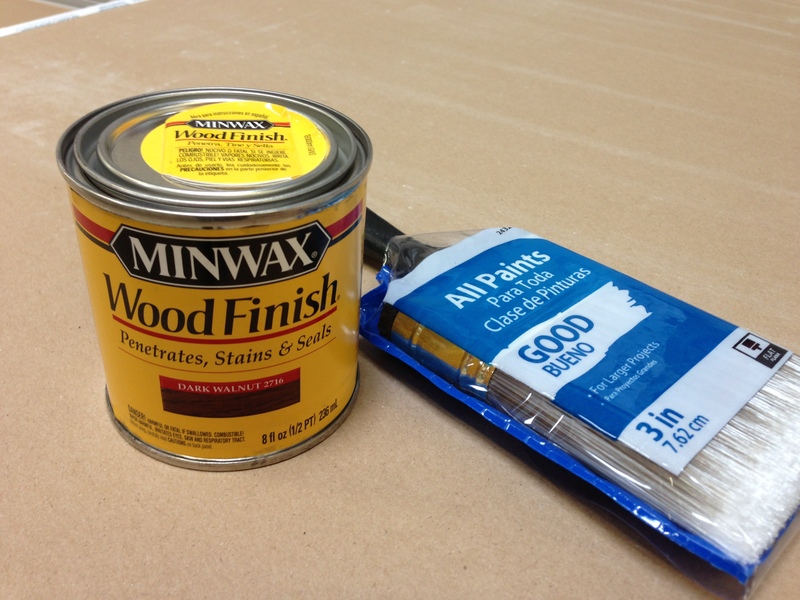 Did you put a finishing coat of varnish on it? Thank you! We didn’t, but I think we should have. It’s been up for a year now, though, and it still looks great! Perfection!!!! If this post hasn’t gone viral, it needs to!!! Love, love, love! Wow, thank you, Lori!! I appreciate it, and I’ll be sure to pass that on to my husband, who built it for me! Love the headboard! Quick question, did you attach the headboa to the bed frame at all, or just the wall? Do you think it will stand ok without attaching to the wall? I would attach just to be sure! How much would you say all of your materials cost? This is gorgeous! I have been looking for ideas on how to make my own and your post is perfect! What a great help! 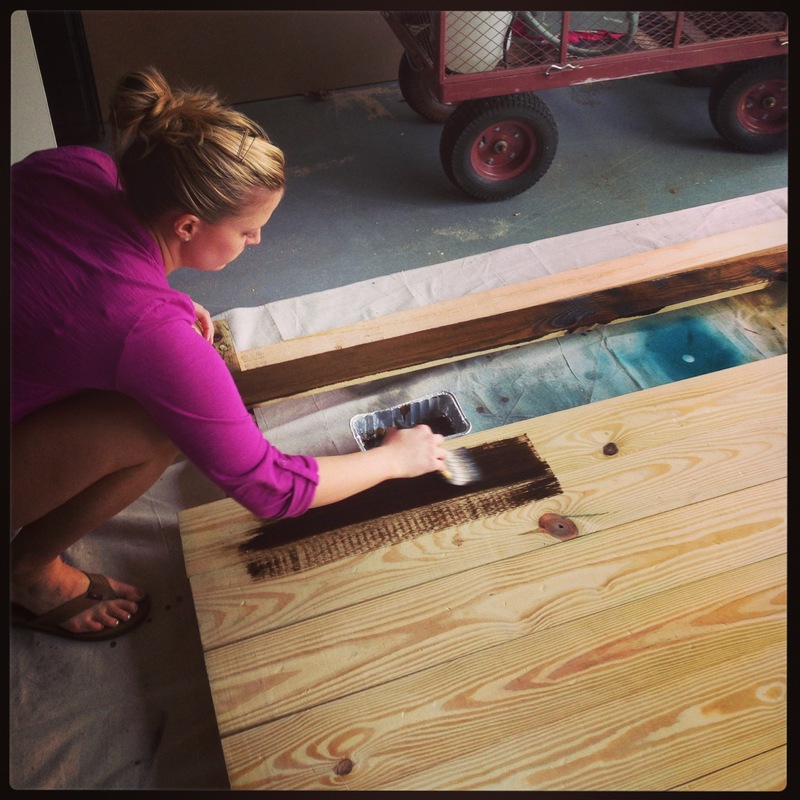 Did you put any sealer or wax on it after staining? Thank you!! We didn’t put a sealer on it since it is inside and is rarely even touched (it’s in the guest room). But I wish we had decided to so it would have a little more shine to it! This is beautiful!! By far the simplest construction that I have seen, which for a family that doesn’t have a ton of experience I feel like we could do this! Question, what type of screws did you use? Thank you! I’ll have to check with my husband and let you know! Hi! I also would like to know the type and more importantly the length of the screws used. Any guess how many might be needed for this project? Thanks so much!! Wow! That looks fantastic! I’m dealing with the same issue, king size bed no headboard (can’t find one I really like). Love your step by step. I don’t have a “Craig” so I’m gonna do it myself😁👍🏼. Thank you for the inspiration! Where did you find those hinges? Like which section at HD? I just made this last night but I just realized I put the bottom support too low and it’s a little wobbly lol. Thanks for the post I still love the headboard! Thanks so much, Bill! Glad you stopped by! So Simple, yet, it leaves such a big statement. Can’t wait to copy you! Thank you so much! We have loved it in our guest room! 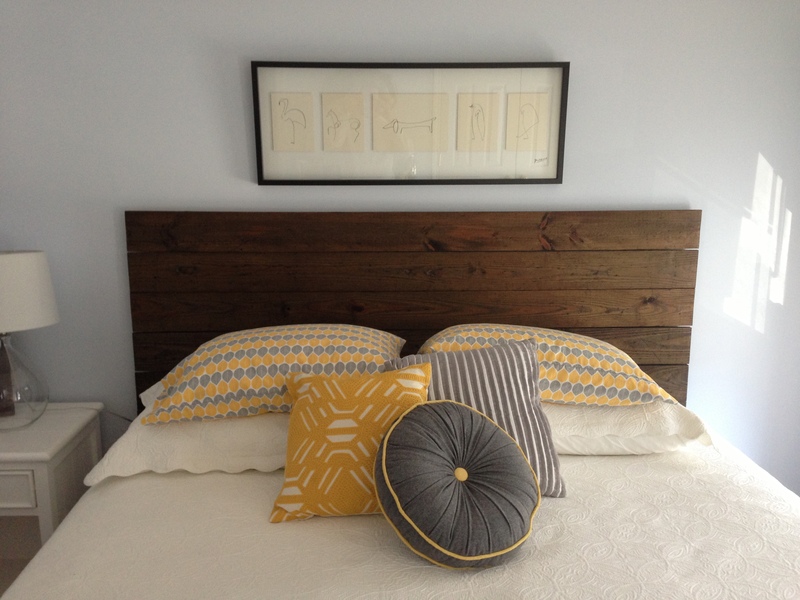 What would you say is the measurement from the side of the mattress to the edge of the headboard? I am thinking about this design for my own project. Your measurements say 77″ but an average king is 76″ wide and the gap looks larger than an inch. Awesome job by the way. Beautiful headboard!! Thank you for your tutorial. Doing the support had me stumped – this helped immensely! 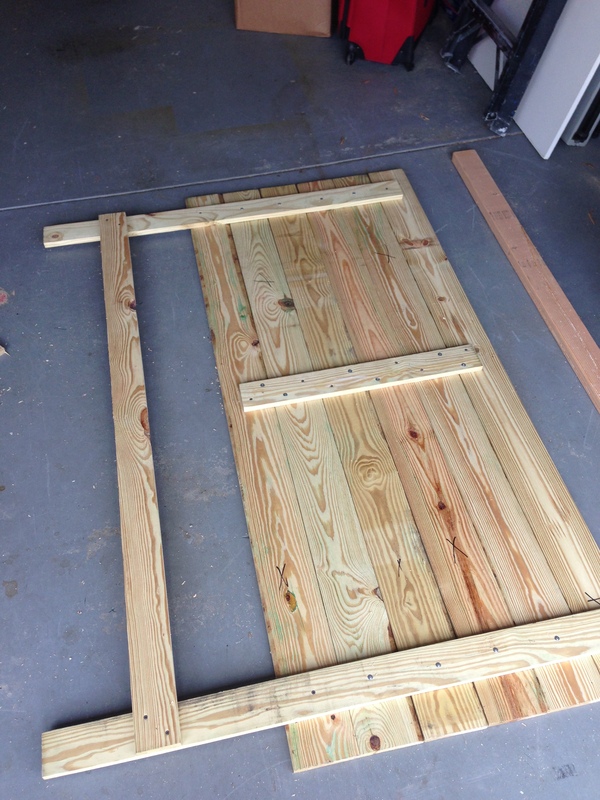 I’m in the process of doing this but I’m using old fence pickets sanded and lightly stained. Warts & all. I’ll post pic when done. Thanks again. That sounds awesome!! It’s been so long since we made this headboard, and it’s really neat to see how many people have checked out the post for tips since then. Good luck! What size of screws did you use? Did you attach to bed frame or hung on wall? We attached to the wall! 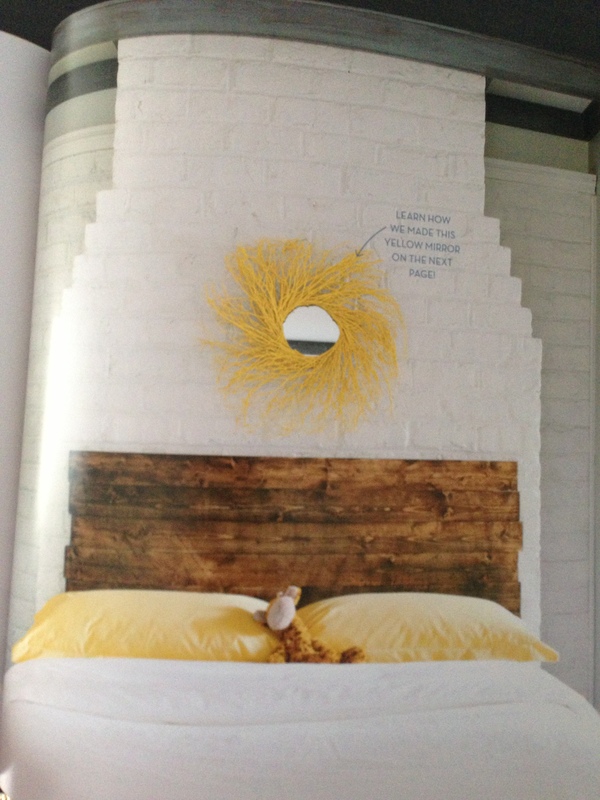 That’s beautiful, and the most simply explained DIY headboard instructions! Thank you for the inspiration!! !